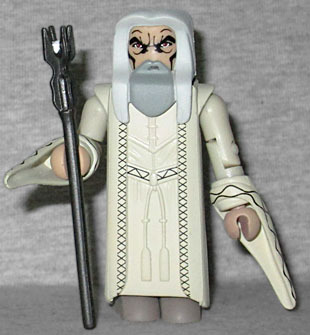 Saruman, the wizard who betrayed the world in favor of Sauron, was played by certified badass Christopher Lee. Has that guy ever played a hero (outside of World War II in real life)? Dracula, Dooku, Willy Wonka's dad... okay, he's played both Sherlock and Mycroft Holmes, but when you saw him in a film, you could generally assume that character was going to be a villain. The Minimate's face has nice shadows and wrinkles, especially under the eyes and the cheeks. His hair and beard are a single piece, as is his large wizard robe; it's sculpted with multiple layers and a tied belt, but it's still a solitary mold and prevents the body beneath from moving. He comes with his staff, but he looks silly holding it thanks to the long, flowing sleeves, which are only designed to look right when hanging straight down. Saruman's toady, Grima Wormtongue, was played by Brad Dourif - aka the voice of Chucky from Child's Play. 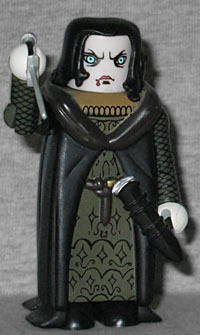 With his pale skin and greasy black hair, this could almost pass for a Professor Snape Minimate! A drop of blood is coming from the corner of his mouth. Like Saruman, his robe is one giant piece covering the entire body, but he has complex paint apps to create the patterns on it. While the robe itself is black, his hood is dark brown, and the smaller robe beneath is olive with mustard trim (which sounds like the worst sandwich ever). The toy comes with his dagger; the hilt is a bit too small for the Minimate to hold securely, but he does have a sheath that can plug into his waist to store it.